The Model 911®E Emergency Tepid Water System is a unique stand-alone solution that fills a critical need in the industry to economically deliver tepid water for high/low flow emergency applications. The Model 911®E ETS provides both water heating and thermostatic mixing for combination shower and eyewash equipment. The 911®E ETS incorporates Lawler’s patented 911®E and 911®E/F thermostatic mixing valves offering positive hot water shut off and full flow cold water bypass together with a water heating source designed to help you meet ANSI Z358.1-2014. 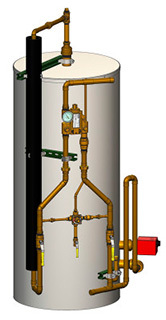 The Model 911®E/F Emergency Tepid Water System is a unique stand-alone solution that fills a critical need in the industry to economically deliver tepid water for high/low flow emergency applications. The Model 911®E ETS provides both water heating and thermostatic mixing for eyewash and eye/facewash equipment. The 911®E/F ETS incorporates Lawler’s patented 911®E/F thermostatic mixing valves offering positive hot water shut off and full flow cold water bypass together with a water heating source designed to help you meet ANSI Z358.1-2014.